From when the child is 6 months old, and before he has learnt to walk on his own, this babywalker is perfect for helping him with his first steps and his first attempts and exploring his surroundings. The Formula Kid babywalkers have been designed with exclusive SILICONE wheels making them extremely quiet, comfortable and easy to manoeuvre. The new silicone wheels are ideal for delicate surfaces like parquet. They are approved and include all the necessary safety systems while guaranteeing the baby’s fun thanks to the multi-activity tray with lights and sounds. To guarantee maximum safety, the walkers are fitted with a non-slip mechanism that locks the walker when it reaches a step and includes a flexible protector around the lower base to prevent scratches and knocks with doors and walls. Suitable for baby’s from 6 months up to 12kg approx.until baby is walking unaided. This patented, innovative, sporty baby walker has many features that will create a world of fun and excitement for your little one. Designed to create a safe environment that will excite and encourage their first steps. 3 height position seat to suit the child’s growth. Flexible protector around the lower base which protects your furniture by stopping it from hitting and scraping against doors and walls. Built-in safety device to stop the walker when faced with stairs/steps. Activity tray complete with lights and real racing car sounds. Silent wheels, suitable for Parquet floors. Folded : 67 x 72 x 42cm. This is the best baby walker around!! Looks fantastic & entertains our little one with all the relevant car noises (starting the engine, indicators, horn & a selection of musical tunes). Everyone who sees the walker compliments us on it. This is the best walker I've brought. The wheels are great they glide across the floor easy with no noise and all wheels turn making it easy for baby to move around. The seat is well padded and the back comes up higher than others to give more support. It looks good and the lights and sounds are brilliant and easy for little hands to work them ! Highly recommended !!! 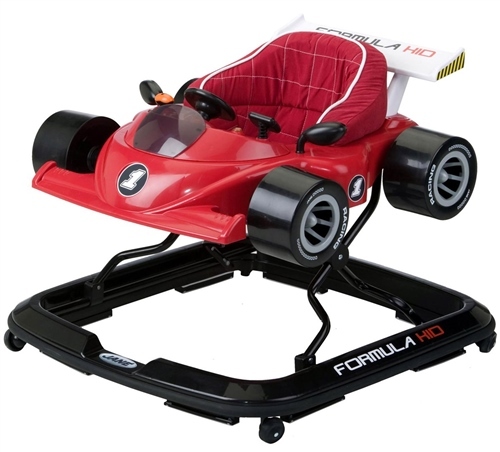 I'm not usually one for writing reviews but i tried to get this product locally but they sold out so ordered off you instead, well lets say my 7 month old boy loves it, all very sturdy and the best thing is the wheels been rubber coated as we looked at many other products similar but the wheels put me off. This got delivered in record time and was very easy to put together infact that easy the wife did it.